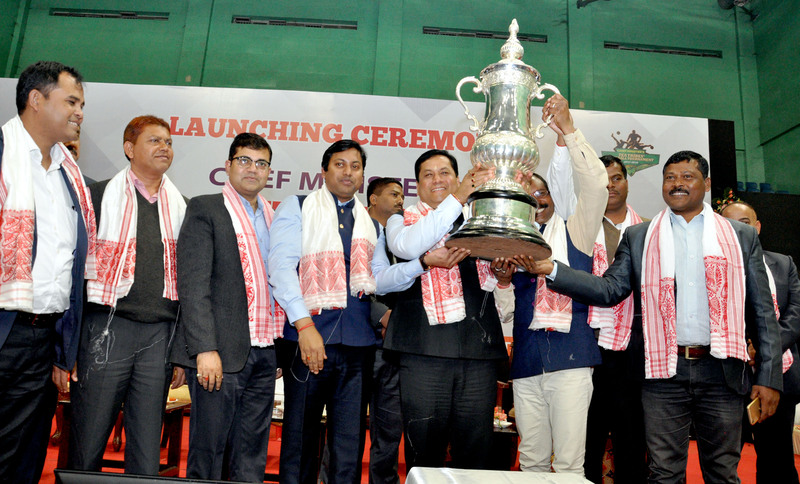 Assam Chief Minister Sarbananda Sonowal unveiling the winner's trophy of Chief Minister's Tea Tribes' Football Tournament in Guwahati on Wednesday. Chief Minister Sarbananda Sonowal on Wednesday ceremonially inaugurated the Chief Minister’s Tea Tribes’ Football Tournament 2017-18 at Deshabhakta Tarun Ram Phukan Indoor Stadium here. The chief minister also unveiled the winner’s cup of the tournament besides unveiling the theme song of the tournament. Informing that the tournament will cover more than 750 tea gardens of 80 Assembly Constituencies in the state where a total of 2000 teams would participate in three tier format of sub-divisional, district and state levels, Sonowal affirmed the state government’s commitment to make Guwahati the sports capital of the country and big push to create adequate sports infrastructure for mushrooming sporting talents. Sonowal said sports symbolises friendship, camaraderie and universal brotherhood. Dedication, determination, discipline and hard labour are the inherent tenets of sports. Quoting the famous lines from a Dr. Bhupen Hazarika song “the whole world is a playground, sports is the harbinger of peace”, the chief minister said peace and harmony can be promoted through sports. Saying that only government effort would not enough to bring sports revolution in the state, the chief minister urged the corporate houses and business establishments to sponsor talented local players and collaborate with state government to create sports infrastructure in the state. Sonowal further said that identifying sporting talents from within the tea community is one of the key focus areas of the Government. Chief Minister’s Tea Tribes’ Football Tournament has been started with this aim to spot talents from the interior tea garden areas and those talented footballers will be trained at the sports school which will be set up by the government for brining laurels to the state and the country, he said. Sonowal also announced that the players from the finalist teams would be taken on exposure tours to major sports hubs of the country and provided opportunity for interaction with the renowned football coaches. He also reiterated the government’s commitment to award Rs 1 crore to players hailing from state who would win medals at Asian level and above and give appointment at ACS, APS levels to the players selected for taking part in Olympics. The chief minister also urged the tea garden owners and management to wholeheartedly participate in this process of identifying and nurturing sports talents for the state and expressed hope that this tournament would bring about a lot of enthusiasm among tea tribe youths for making sports a way of their lives.